In late 2010, the UK Government published the Sir John Lawton review of wildlife sites in England: Making Space for Nature. The headline conclusion was that wildlife needed more, bigger, better and connected protected areas. The RSPB has been determined to play our part in contributing to this vision through our advocacy, advice to landowners but also practical conservation work. We were delighted that this vision was adopted first in the 2011 Natural Environment White Paper (which spawned Nature Improvement Areas) but also reaffirmed in the recent 25 Year Environment Plan which goes further and calls for the establishment of a nature recovery network. We are determined to contribute to this vision by working with partners to transform landscapes including through the management of our own nature reserve network. That's why we have stuck to an ambitious target to double our landholding from 2006 levels so that we protect and manage 260,000 hectares by 2030. We already give over 16,000 species of birds, mammals, insects and plants a home on 214 reserves, covering an area roughly the size of Greater London. But, today, I’m delighted to announce that after four and half years working with our friends in the New Forest National Park Authority, the RSPB has taken ownership of a brand new nature reserve in the north of the New Forest National Park. Below, my colleague, Tony Whitehead (Communications Manager for the RSPB in the South West ) introduces the newest addition to our fabulous nature reserve network. Franchises Lodge, near Nomansland in Wiltshire, is a 386 hectare (almost 1,000 acre) woodland of deciduous and conifer trees that has largely been inaccessible to the public for many years. This inaccessibility has led my south west colleagues to describe it as a “secret forest”. What we do know about it, is that is home to a wide range of birds, invertebrates and plant life. Already we are looking at a really good population of woodland birds, including specialists such as wood warbler, redstart and hawfinch. It also appears to have a healthy population of firecrest. And of course, it’s not just about the birds, it also has a potentially nationally important flora and a wide range of invertebrates. And rare mammals such as Barbastelle bat. Over half the site (213 hectares / 526 acres) was given to the RSPB by the previous owners as a gift to the nation in lieu of tax, as part of a settlement with HMRC. Land can be “given to the nation” in in this way then passed to trusted organisations for upkeep, much in the same way as treasured works of art can be given to the nation. But this is only where the land is “of outstanding scenic, scientific or historic value” and the recipient is a trusted organisation, in this case one with an international reputation for excellence in land management. This is a ground breaking deal for the RSPB setting a great precedent for future acquisitions. In financial terms this gift is the largest donation by a living person in the RSPB’s history. At the request of the family, the gifted land will be referred to as the Moffatt Reserve. 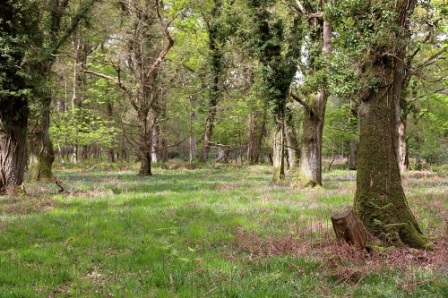 The remaining part (173 hectares / 428 acres) was bought through a generous legacy to the RSPB, and support from the New Forest National Park Authority and the Friends of the New Forest. In our 25-year vision for the site we will be focussing on maintaining the existing broadleaf woodland, enhancing areas of wood pasture and recreating open heath. We are very keen to make sure that the reserve compliments the existing wider cultural landscape of the New Forest. A crucial part of achieving this will be to re-introduce extensive grazing and we will be working closely in partnership with the commoning community, particularly to get the right sort of animals to graze the site. Crucially, it also provides a unique opportunity to create a nature rich bridge between two already nationally important areas (Langley Wood NNR to the North and the New Forest SPA to the South) embodying the principles of 21st Century landscape conservation: “bigger, better, more joined up”. Naturally we want people to enjoy the site, but we have to understand much more about its nature and ecology and consider the views of local communities before making any decisions about wider access (beyond the existing rights of way). The existing Byway Open to All Traffic will remain open but in the early days we are not encouraging visitors due to the simple lack of facilities, including car parking space. However, we always aspire to give people the opportunity to enjoy our reserves and when taking on land to create exemplary and inspiring visitor experiences. Any major changes would be determined through consultation with the community and we’ll need to go through the normal planning processes. Watch this space! Great news and another major RSPB achievement. Really only the RSPB has the required “muscle” to bring this size of reserve “on board”. Congratulations to all involved. Even though this is good news for wildlife. I often wonder when Northumberland, County Durham or Tyne and Wear are going to get some reasonable large RSPB reserves. as I’ve been waiting since I first joined the RSPB in the very early 1970’s for some RSPB reserves apart from the long established tiny Coquet Island. I’m now 65 years of age and still waiting and soon to be 66. I fear I’ll never see any new RSPB reserves in my lifetime in these 3 counties as it seems as though Cleveland in North East England keeps getting additional small RSPB reserves to Saltholme. I keep hoping! !